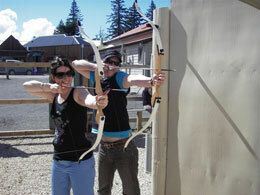 Pull back the string, sight the target and release – relive the past as you sample this ancient sport at our purpose-built archery range in the heart of Hanmer Springs Village. Archery has a long history the world over. Tribesmen were hunting with bow and arrow at least 25,000 years ago, and still are today in remote areas. Many historians think the invention of the bow was as important as fire and the wheel. Although originally the bow and arrow seem to have been used for battle or for hunting, they have also been universally used for sports and tests of skill. Here in New Zealand (and worldwide) it’s a sophisticated sport that is increasing in popularity as modern technology introduces improvements to equipment. 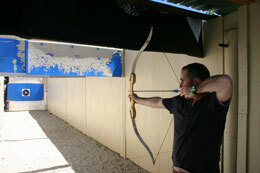 At Hanmer Springs Adventure Centre we use a variation of the composite recurve bow, very similar to those the ancient Egyptians, Greeks, Persians and Chinese (among others) used in battle and for sporting contests. Test yourself - can you hit the bullseye? Compete against your friends to get the highest score!